Expandable panel of fast access to frequently used functions. Expanded view displays a connect to Wi-Fi, Bluetooth, Silent mode, screenlight, adjust brightness, battery level (in terms of capacity). 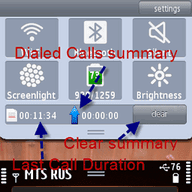 Optionally shows clearable calls duration. In Collapse: the battery level and fast lock your phone (top left corner of the screen). In locked mode camera button allow unlock, dial number or run application. AutoHello, PocketLock. Languages: en, fr, ge, sp, it, ru.